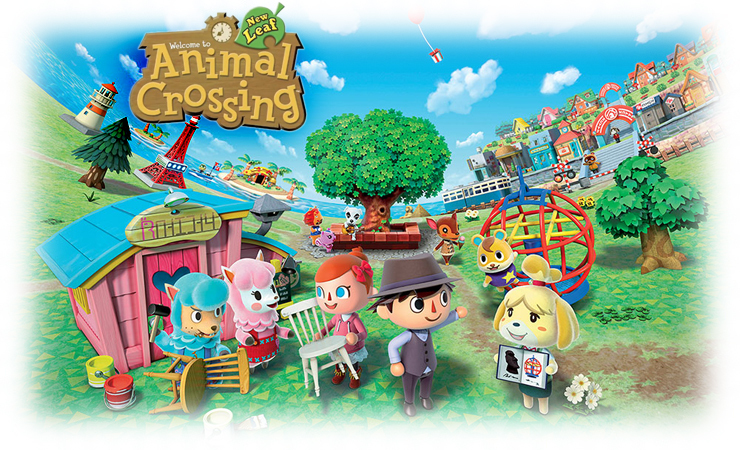 Animal Crossing: New Leaf reviews, coming in hot! I realized today that I'm so hyped for this game, I have barely even thought about E3. I think I need to calm down a bit! Hmm...how about some relaxing music? Yeah, I figured 1 AM would be soothing and probably never heard in actual gameplay because I'm too dang old to be up playing video games at 1 in the morning. I understand waiting another three days before looking up those songs. I personally have not been avoiding information. It's not like it's a plot-driven game, after all. I refuse to watch translated plays of Rune Factory 4 for that reason. There's just too much plot there. I do regret a little bit that I won't be surprised by lots of things (made you look, hehehe). Just watched the GT Video Review, and it has me genuinely excited for the game. So now the question is who will be my best friends? You did make me look! lol And I even hesitated slightly before. Where are you guys buying this? Anand mentioned it would be $30 at K-Mart? Is that on Sunday, or does it drop later? Digital. It just feels like a game I'll always want locked and loaded. I think my sister is bouncing between finding a K-mart near her, supporting her local gaming store, or ordering it online with free shipping. Hmm. Because I'm reasonably sure that in six months I'll still load this game for around 15 minutes every day. It'll be more for the first few months, as I'm working on building up the town and need lots of money. Eventually I'll get a slight completionist compulsion to check every day for new items in the store before switching over to Rune Factory 4. I will never sell the game back to the store for $5 and none of my friends will want to borrow it. I don't mind digital downloads. I like the convenience of it. I understand the fear of losing all the games at the same time as the system. Boy, do I. My Advance was stolen from my car many years ago with my copy of Harvest Moon: Back to Nature. That really cut me deep. But the fact that it was a physical copy didn't protect my beloved Popuri from being torn from me forever. I've got games on cartridges, some of them in my little 3DS case. They'll be just as stolen or lost as Animal Crossing if that happens. Yeah, we don't sell anything back either, so its not that. I was just wondering if there was something else. Having stuff stolen is a big thumbs down, too. Sorry about your Popuri.. So you're a Popuri person too? Man, I married her in 64 and More Friends of Mineral Town. I married the down to earth brunette in A Wonderful Life. Life imitates Art. It's weird because I can't manage to happily marry anyone else. The only other two characters I've married were Nami (who I put on suicide watch) and Shara (who treated me like a child). Note that these are the two games that require marriage to complete the storyline. Bachelor for life. I'll probably get Rune Factory 4 physically because I doubt I'll play it after finishing the main story line. That and I may loan it to my sister. Wow everyone... I don't know how others will agree with me but so far this is my favorite of the soundtracks. As I earlier stated earlier, I was considering listening to 2am through 4am from the new game because I will not be playing around those times anytime soon. I might get up a little earlier before work so the 5am music might be possible and on a weekend, I no doubt will hit 1am sometime. These details I'm sure concern nobody. BUT! My girlfriend, EponaEatsCarrots, and I had a little listening party just now. I played into our video chat the 2 AM, 3 AM, and 4 AM musics from all three games (which have different music that is). I love Animal Crossing (GC) music but I realized it was very simple in comparison to the later Wild World. I realized how many nice additional layers Wild World had. So after listening to the GC 2 AM, and the Wild World 2 AM,... I listened to my first Animal Crossing New Leaf music ever... the 2 AM track... and as you all should be wildly clear on by now... the music is one of my favorite things about the series and it was single-handedly the reason I was so disappointed in City Folk.... because it wasn't fresh. My friends.... the New Leaf sound is amazing. These subdued night songs are so wonderful and a touch funky. I can only begin to fantasize and imagine what the day time musics will sound like. I am so tempted to have another Euphonic special just focusing on the New Leaf soundtrack, lol. I am in FULL HYPE MODE. I literally cannot be any further hyped. This game must be mine. I am crazy for letting Amazon be my gatekeeper but I am doing so to match my girlfriend who is getting it through those means too. I have posted the three tracks below for the curious, though if you plan to play at those times... perhaps you should experience the wonderfulness live. This is truly Euphony. They've done it again. I may have broken Fink's will. Sorry; my bad! Does anyone know how big this game is going to be (blocks), to do the digital download on? 6000 or so I think. I thought I read that somewhere on GoNintendo.